Guy Montag is a fireman; but in this world a fireman's job is to find books and burn them. In the society Montag lives in, people don't think or feel, they just go on doing what they're told. Teenagers drink and hurt/kill other for fun. There are virtual families, only television screens to interact with. Books are banned; people in possession of books are put in institutions, their books are burned along with their houses. Montag lives a content life as a fireman. That is, until, one day, he meets his new neighbour, Clarisse McClellan - the seventeen year old, who is endlessly curious about all the things the world has forgotten to care about. In this bland lifeless world, she represents individuality and freedom. The young girl makes Montag question his happiness, makes him feel uneasy about the life he lives. 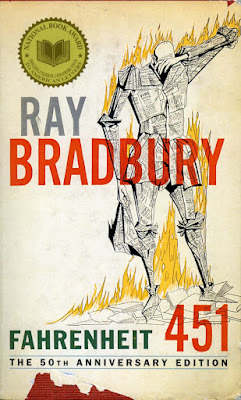 I haven't read many dystopian novels, but I always wanted to read this book. The idea of a world without books is scary, fascinating and even after all these years (the book was published in 1953) very relevant. You hardly see kids playing in the park anymore, usually they just sit at home and play videogames. Reading is un-cool and the movies are becoming increasingly nonsensical. Don't you think? And so the author shows us the future - a world where those who dare to think and feel differently, those who dare to think at all, are suppressed by the society. 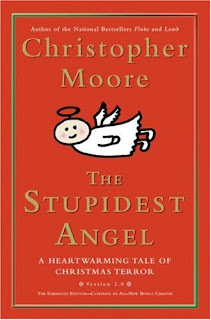 "With school turning out more runners, jumpers, racers, tinkerers, grabbers, snatchers, fliers, and swimmers instead of examiners, critics, knowers, and imaginative creators, the word 'intellectual', of course, became the swear word it deserved to be. You always dread the unfamiliar. Surely you remember the boy in your own school class who was exceptionally 'bright,' did most of the reciting and answering while the others sat like so many leaden idols, hating him. And wasn't it this bright boy you selected for beatings and tortures after hours? Of course it was. We must all be alike. Not everyone born free and equal, as the Constitution says, but everyone made equal. Each man the image of every other; then all are happy, for there are no mountains to make them cower, to judge themselves against. So! A book is a loaded gun in the house next door. Burn it. Take the shot from the weapon. Breach man's mind. Who knows who might be the target of the well-read man?" The author doesn't ask us to really follow books, because that would be as dangerous a statement as any. Reading makes us think (contemplate, whatever.) It is like food for the mind. The author wants us to be curious; remember why things should be done and not just how. Reading helps us hold on to the thing that makes each of us unique; our mind, our opinions. It's a beautiful concept, the theme of this book. What I didn't appreciate, was the execution of the idea. The fast-paced, science-fiction-ey style of writing makes it an exciting read. But, the book is too short; Montag has his epiphany-moment, even before you understand this new world or its rules. The characters are strong and the novel, with all its metaphors and symbols, gives you a lot to ponder over; but too much is left to you. I would have liked a longer history of how society got to this point, or Montag's life over the years, before this abrupt turn of events. That being said, I do think it is a book everyone should read. During the German Literature Month - November 2011, I received two books by the Nobel Prize in Literature winning author, Heinrich Böll as part of a giveaway (big thanks to Caroline @ Beauty is a Sleeping Cat and Lizzy @ Lizzy's Literary Life) - his first ever novel, The Train Was on Time and another renowned one, The Clown. A week before I wouldn't have been able to name my favourite German writer. Now, these two hauntingly beautiful novels seem to have changed that. About the book: Published in 1949, The Train Was on Time (original: Der Zug war puenktlich) is Heinrich Böll's first novel. "That's something no one would ever be able to understand, why I don't take the next train back to her... why don't I? No one would ever be able to understand that. But I'm scared of that innocence... and I love her very much, and I'm going to die, and all she'll ever get from me now will be an official letter saying: Fallen for Greater Germany..."
Summary: The novel is the story of a soldier, Andreas, who is stationed on the Eastern Front. Hitler has already lost the war; and as the troop train leaves Germany and slowly enters Poland, Andreas is sure of his eventual death. The story is about Andreas's last train journey, the fellow soldiers and their experiences. My thoughts: I found this to be a beautiful novel, like I said, hauntingly beautiful. The emotions portrayed in this novel are painful but real. A blurb on the back cover says that "Böll has feelingly symbolized a guilty Germany doing penance for its sins through suffering and death." I couldn't have said it better. About the book: Published in 1963, The Clown (original: Ansichten eines Clowns i.e. Opinions of a Clown) is an acclaimed work (an instant bestseller of its time) and a German classic by Heinrich Böll. "I don't trust Catholics," I said, "because they take advantage of you." "And Protestants?" he asked with a laugh. "I loathe the way they fumble around with their consciences." "And atheists?" He was still laughing. "They bore me because all they ever talk about is God." Summary: Hans Schnier is a famous clown; a clown whose 'wife' seems to have left him because he won't marry her within the Catholic church. This searing loss has affected the man and the clown in him, and now alone at home, Schnier launches into a long, mordant monologue - that is this book. For the first time I sensed how terrible are the objects left behind when someone goes away or dies. Mother actually made an effort to eat, no doubt it was supposed to mean: Life goes on or something of that sort, but I knew very well: that wasn't so, it isn't life that goes on but death. My thoughts: The Clown is one of the most amazing books I've read, and definitely my favourite this year. The novel is written in a style that along with being deeply painful, is strikingly intelligent and humorous. The inability of the young man to fit in with his own society, an outcast and the helplessness of a nonbeliever in love with a devout, of a child who has lost his sister to the war, are the themes dealt with in the novel. About post-war Germany, it seems that the author has a lot to say - country struggling to find a new identity, Nazi-guilt, religion and post-War German consciousness. What upset me was the innocence of the returned emigrants. They were so moved by all the remorse and loud protestations of democracy that they were forever embracing and radiating good fellow-ship. They failed to grasp that the secret of the terror lay in the little things. To regret the big things is child's play: political errors, adultery, murder, anti-Semitism - but who forgives, who understands, the little things? The way Herbert Kalick grabbed Götz Buchel by the collar, stood him in front of the class, although the teacher protested mildly, and said: "Look at him - if that isn't a Jew!" I remember too many moments, too many details, tiny little things. I have heard people mention that the scope of the book is too narrow, the intended audience and the people who can relate to it. But doesn't everyone have something they are/should be guilty about, every person and every country? Someone they have lost and the whole question of religion. I think, when put in to the right context, the book can be about any society, about any of us. It's a must read and kind of a collector's piece! I see myself re-reading this book many times! German Literature Month - November 2011 (hosted by Caroline @ Beauty is a Sleeping Cat and Lizzy @ Lizzy's Literary Life) ended yesterday. I haven't been much active lately, because I have been quite busy reading Stephen King's amazing new book - 11.22.63 along with the two great books I received during GLM itself, i.e, Heinrich Böll's Clown and The Train Was On Time. I guess seven books in the month is a lot more than I thought I would read. I do look forward to reading more German literature! !